One way to keep employees happy is to hold morale-building events. If you’re looking to boost the spirit of those in your company, you should connect with NY Party Works. We’ve been helping plan corporate team building and morale boosting events since 1993 and we can help you energize your employees. Treat employees with respect and in a way, they understand that they matter. Empower employees to make decisions about their job. Offer benefits and salary above the industry average. Give employees perks and organize company activities. NY Party Works can help with the last two suggestions. If you’re looking to create an event to recognize employees or want to organize fun team-building corporate activities, we have the services and rentals to help you organize successful corporate events. If you’re looking to create an event that will build morale, NY Party Works has what it takes. If you’re looking to do team building activities, why not have an adventure? If you have the space to plan an outdoor event, our Zipline can bring up your employees morale and adrenaline at the same time. Another way to feel a rush is to rent one of our climbing walls. From the traditional 25 foot Rock Wall which can accommodate up to four people at once to our unique Klime Walz which are inspired by pop art, geometric shapes, playground classics and ninja warriors. Or you can try out your rodeo skills with our mechanical bull. Our inflatable wall around the bull will keep you safe. If you’re more of an ocean adventurer than a cowboy, try our mechanical shark. Are your employees all about fun and games? Then NY Party Work has you covered with some of the most cutting-edge party rentals available. Why not transport them to another world with our Virtual Gaming Experience. It’s state of the art with a high-tech Sony VR headset and there are plenty of games to choose from. Your guests can watch on an overhead monitor. 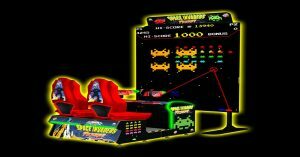 Or you can rent our popular arcade games such as Space Invader Frenzy, a fresh update of the classic video game. You may want some healthy competition for your workplace. We can do that with our sports rentals such as the popular Pop-a-shot Basketball and Football games. Or you can go with more virtual reality with our VR Golf and VR Surfing games. At NY Party Works, we can help you reward your employees. If you’re planning a corporate holiday party, award presentation, retirement party or any type of meeting we know it can be difficult to plan. That’s why we offer Total Event Planning. We’ll work with you to determine the goals of your event and we’ll also work with your budget. Then we’ll plan every aspect of your event so you can concentrate on building morale. All you have to do to make it happen is contact NY Party Works today.